Removal 2/25 - 3/01 from 7am - 11am & 12pm - 2pm By Appointment Only. 2/25 - 3/01 from 7am - 11am & 12pm - 2pm By Appointment Only. Please contact Nelson Irvin at 817-929-4380 or Greg Gonzales at 817-269-7641 to schedule a removal appointment. 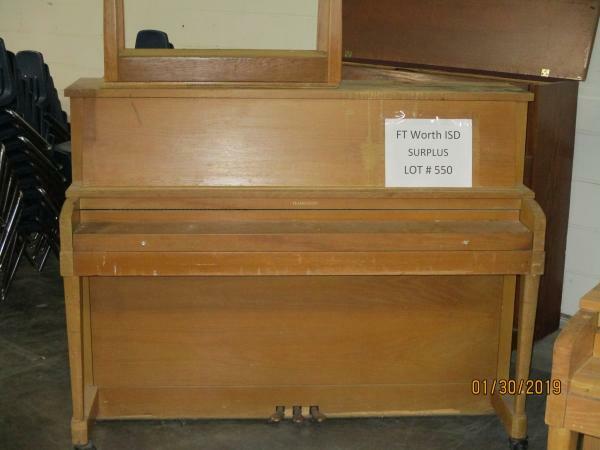 If items purchased are not removed by 3/01/19, the buyer forfeits all monies paid and the property reverts to the Fort Worth ISD with no recourse. There will be no exceptions to these removal dates! IMPORTANT NOTICE: Winning bidder will be responsible for break down, disassembling and removal of the entire piece. Partial removal is not available. The Winning bidder will be responsible for loading and removal of items/equipment. NO ASSISTANCE, SHIPPING / PACKING SERVICES or EQUIPMENT will be available by Fort Worth ISD employees for the removal of items won. Please present a copy of your paid receipt and a valid Government issued picture ID when picking up all items. Written authorization must be provided to the seller allowing a person other than the buyer named on the paid receipt to pick up items.